Interesting! Phaedrus Audio DisC is neither a strain-gauge, nor an occluding optical-path cartridge, but uses Displacement-Sensitive Phono Cartridge approach in absence of typical RIAA EQ... 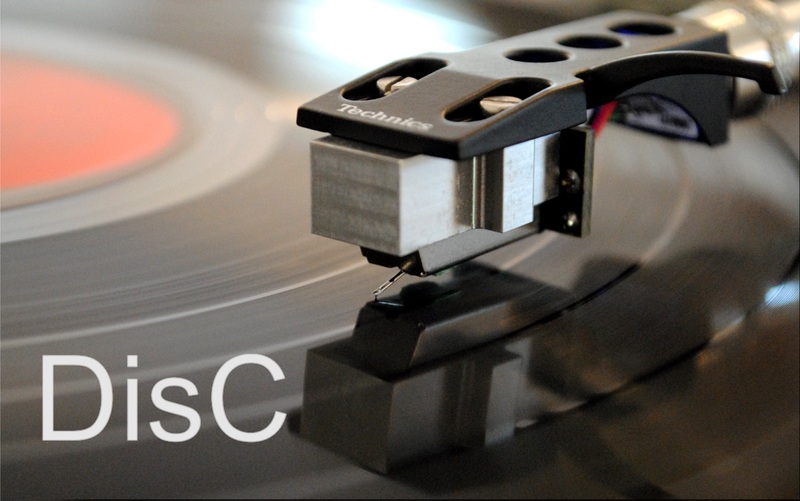 In the last few years, there has been great interest in phono cartridges based on strain-gauge transducers in which the stylus is coupled directly to a transducing element made of silicon, similar to the base region of a transistor. This type of transducer is pressure-sensitive so that the displacement of the stylus controls the resistance of a conducting channel. The movement of the stylus is thus translated directly into a signal voltage. Rather similar to the old ceramic cartridges of the past, these cartridges are not electrodynamic generators and thus do not require movement of an armature to derive a signal. The transduced quantity is thereby not stylus velocity, as it is in a moving-coil or moving-magnet (or moving-iron) cartridge. Instead, the output voltage is a direct measure of the amplitude of the stylus movement within the groove. 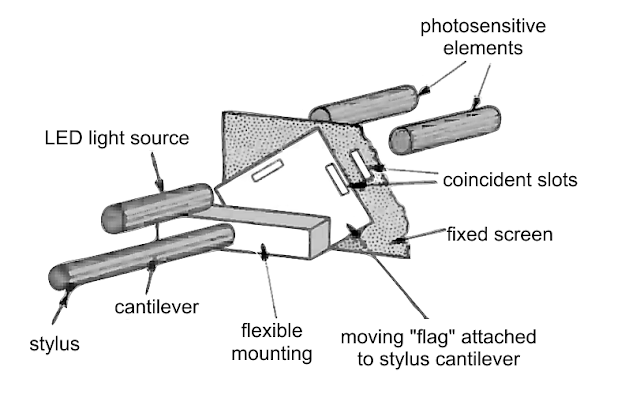 Another new cartridge type (although, in truth, as with the strain-gauge type, both modern variations on very old themes), is based on light-valves in which the movement of the stylus controls the amount of light falling on a photo-sensor. Once again, this type directly senses the displacement of the stylus as it moves in the groove1. Both these displacement-sensitive cartridge types, have been received to great acclaim by the audio press who attribute their particular quality to the minimal equalisation required by a phono cartridge of this type and for the concomitant simplification of the replay electronics. Given the reputation of displacement-sensitive pickups as the primo inter pares in the world of high-end phonograph cartridges, we believed that we at Phædrus Audio ought to see if it was possible to develop a cartridge of this type. It is..... and the result we have named DisC (for Displacement Cartridge). Displacement-sensitive cartridges aren't new. In fact, there was a time that the vast majority of phono pickups were of this type. Older ceramic cartridges sensed groove displacement and dispensed with electrical equalisation entirely. Generations of small record players used the signal directly from the "crystal" or ceramic pickup to drive a simple amplifier formed from a single valve (tube). The circuit diagram of one such unit, the Dansette Bermuda is illustrated below. Go to the link for the reasons why a displacement-sensitive cartridge does not require equalisation. Circuit diagram of a record player by Dansette in which the ceramic cartridge directly drives the single valve amplifier (via the volume control). No equalisation is required. The Phædrus Audio DisC brings forward this technology from the sixties to the present day with a phono cartridge which doesn't need RIAA equalisation. The Phædrus Audio DisC is neither a strain-gauge, nor an occluding optical-path cartridge. (Nor a ceramic type!) Instead, a moving-magnet cartridge element is operated as an element in a special very low-impedance circuit configuration such that the short-circuit current generated at the output of the cartridge is an accurate analogue of the groove displacement. This arrangement is especially advantageous because it avoids the mechanical impedance limitations which beset the strain-gauge type - and the ceramic cartridge of yesterday2. The low-impedance operation (and therefore low-noise) of the moving coil type; The superior tracking of the low intertial-mass moving-magnet type; and The low-equalisation requirement of the strain-gauge or optical type. Recovery of the current-mode signal from the DisC cartridge, suitably equalised, for sending to a standard preamplifier or integrated amplifier is performed by the PHATHOM base-station (the interior of which is illustrated above). No modifications are required to turntable or cabling to support a DisC cartridge. The cartridge body is tapped, so that it is fixed to the headshell simply; with 2 x 2.5mm stainless steel bolts (which are supplied). 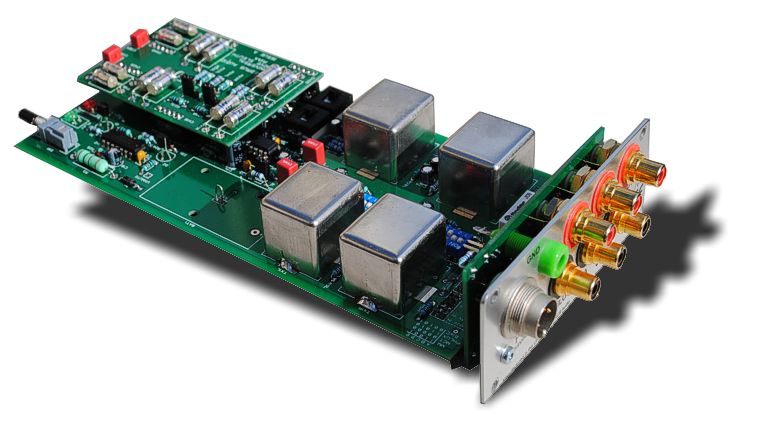 The DisC cartridge, the PHATHOM base-station (preamplifier) and its associated (RESOLVE) power supply are supplied as a package. Prices are here. Why does a displacement-sensitive cartridge not require equalisation? The truth is that they do.... a bit! But the equalisation is not the well known RIAA type equalisation and it is more than an order of magnitude less intense. Thus, if the record cutter-head is fed a signal with has a constant amplitude with respect to frequency (a signal with a flat frequency response), the cutter will respond to this signal so that, as the frequency increases, and the slope of the signals steepen, the amplitude of the groove inscribed on the disc will fall. We say that the grooove has a constant-velocity characteristic. Now, if this record is played with a cartridge which responds to the velocity of the stylus as it traces the groove (and all modern, electrodynamic cartridges do), it will reverse the effect of the cutter and the output signal will once again has a flat characteristic with respect to frequency. Put simply, the falling response of the cutter is cancelled out by the rising response of the cartridge. This mirror-image nature of cartridge and cutter is why we can speak of complementary recording and playback equalisers. But in doing so, it's easy to forget that the physical "wiggles" inscribed in the disc do not match the frequency characteristic of either the pre-equalised signal, or the post-equalised signal. They exist in a little-appreciated nether-world. 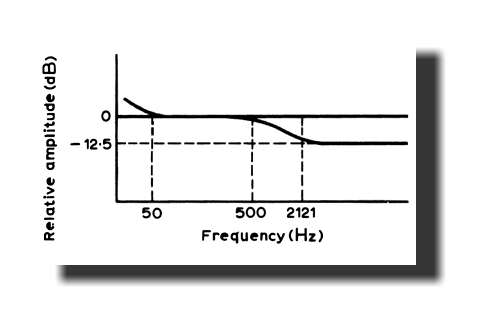 The frequency response of the groove inscribed on the surface of an LP record: mostly flat with a modest shelf at high-frequencies. Now, if a cartridge is used which responds directly to the groove amplitude, nearly all that is required to correct a record recorded with the RIAA characteristic is an equaliser which restores the treble section to that of the bass: a signal manipulation which is just 4% of hundred-fold ratio enshrined in the RIAA characteristic. An appreciation of the modest requirement for equalisation may be appreciated by the fact that, in older ceramic type cartridges, this gentle equalisation was achieved with a gentle, mechanical resonance at high-frequencies. 2 The mechanical impedance of the transducing element in a strain-gauge cartridge is several hundred times greater than the permissible stylus tip impedance. It's no easy matter designing a cartridge in which the stylus ultimately pushes and pulls upon a mass.